Start planning your Epcot Food and Wine Festival visit with the pre-order for the 2019 Guide! You will receive a free, instant download of the 2018 edition as part of the pre-order. If you love the Food & Wine Festival as much as we do, we’ve bundled some of our books for even more savings! DFB Bundle: All Guides – Everything you could ever want to know! 75 days of special events, 40 tasting booths, and a few celebrity chefs to meet? How do you fit it all in without breaking the budget? 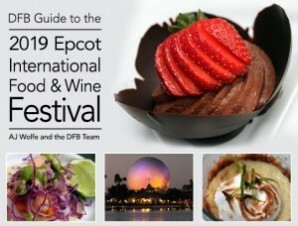 We’ve got the very best tips, information, and advice to be sure you enjoy every minute of your time at the 2019 Epcot Food and Wine Festival in our DFB Guide to the 2019 Epcot International Food & Wine Festival e-Book! With over 250 pages of information, you’ll be more than ready to dive right into the festival! So much is going on at the Epcot Food & Wine Festival this year – find out how to make the best of your time there! The 2019 Epcot International Food & Wine Festival is quickly approaching! 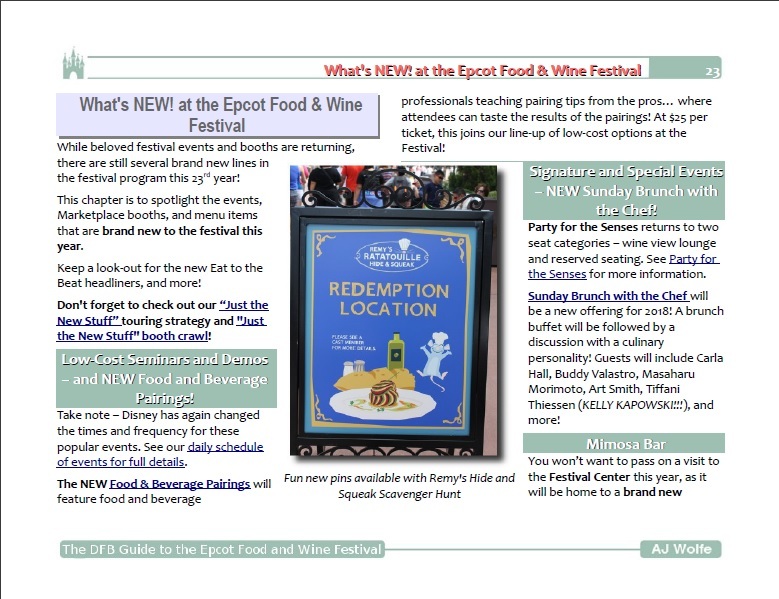 It’s the biggest Food and Wine Festival of its kind in the world and can be overwhelming, but with a bit of pre-planning with the DFB Guide to the 2019 Epcot International Food and Wine Festival, you’ll be able to determine what events, demonstrations, and menu items are most important to you and your family, and create a strategy to make sure you experience them. This book includes plenty of insider tips and details we’ve discovered through years of attending the Food and Wine Festival! From special events to culinary demonstrations, mixology seminars to World Showcase booth grazing, if it’s at the Festival, we’ve done it! And we can’t wait to share our hard-earned tips and tricks so that you can avoid any Food and Wine Festival pitfalls. 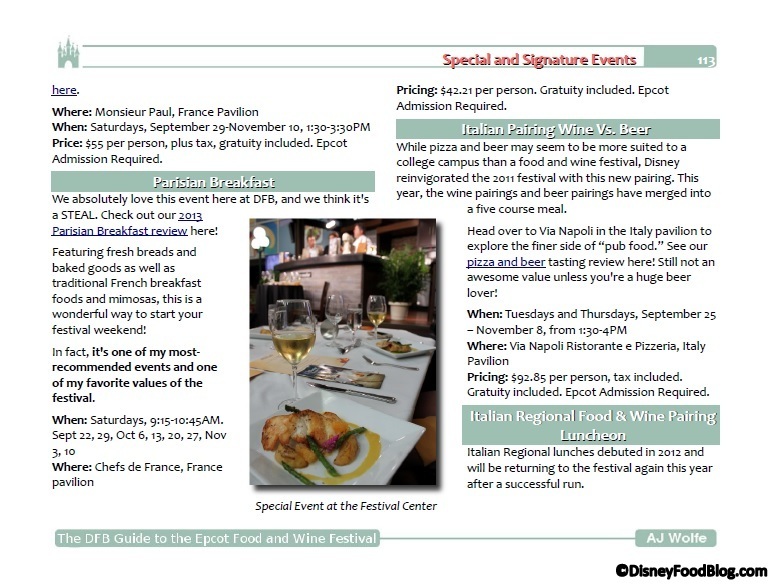 Planning ahead is the best strategy for tackling an event as huge as the Epcot Food and Wine Festival! Read reviews of special events and seminars, and see photos of the food that will be available at the 2019 World Showcase booths before you go so that you can make the best use of your time and money in Disney World. Hundreds of thousands of people use AJ’s Disney dining advice every day, so you can feel confident that your plans are in safe hands. 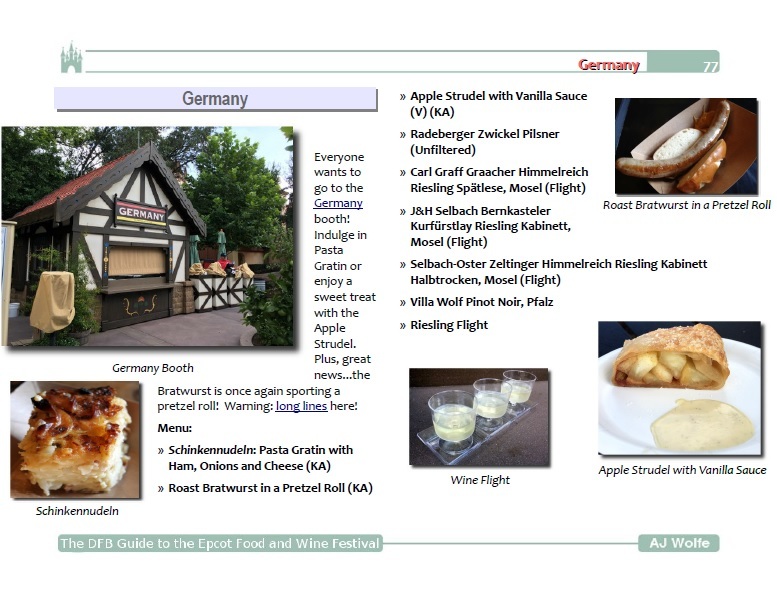 If you don’t feel the DFB Guide to the 2019 Epcot International Food and Wine Festival e-Book is worth the price, just let me know within 30 days and I’ll refund your money. As you can see I’m very confident that you’ll be thrilled with the guide and get many times your investment back in money savings, time savings, and more fun on your vacation. Themed Booth Crawls — a great activity for a group of any size or a solo adventurer! These booth crawls group together similar items so that you can hone in on what you’ll enjoy the most! We even have one for the kids! A Full Daily Schedule of Events — This is the only place to get a full daily schedule of events for the entire festival anywhere, online or in print. With this schedule, you can quickly and easily determine what events and activities you want to take advantage of no matter when you’re at the festival. A Printable World Showcase Booth Menu Checklist — Stay ahead of the game and strategize what you’ll be eating at the festival with this handy, printable checklist! Menus and Photos from Every World Showcase Booth — Plan ahead and be sure you know where you want to spend your vacation dollars by checking out what the menus and food items look like at the 30 World Showcase Booths! Be strategic with your time and money by using this great resource. Customized Touring Strategies — We’ve prepared customized touring strategies to make sure you get the most out of your visit. At the Food and Wine Festival for just a half-day? Two full days? With kids? On a budget? We’ve got suggestions and recommendations about how to make the most of your time.